Winter isn't technically here yet, but that's not going to stop a giant winter storm from ruining our lives this week. It's almost inspiring if you think about it the right way -- but also a huge annoyance if you actually think about it at all. Winter Storm Avery is currently crossing the country, and forecasters are predicting that it's going to be ruining moods all across the South, Midwest, and Northeast. Depending on where you are, you can expect rain, snow or a wintry mix of sleet and freezing rain, according to a report by The Weather Channel. As of Wednesday, warnings and advisories are already in place in several states, and snow and sleet have been spotted in Louisiana, Arkansas, Oklahoma, and Missouri. The Ohio Valley and the Southeast can continue to expect wet and cold weather. Just when you thought Wednesday was bad, Thursday and Friday look worse. By Thursday, there’s a possibility of snow in cities like Boston, New York City, Philadelphia, Baltimore, and Washington, DC. 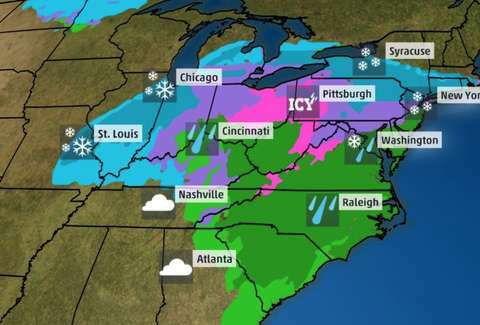 According to The Weather Channel, West Virginia, Virginia, Maryland, and parts of Pennsylvania could also see “damaging accumulations of freezing rain." On Friday, areas across Pennsylvania, central and upstate New York, and northern New England could be hit with snow. Lake-effect snow could come to the Great Lakes snow belts that night and through the morning. The greatest chance of serious snow, however, is in central Pennsylvania and western and northern New England. But all of these areas mentioned are subject to sleet and rain. It'll be a snowy finish to the week for portions of the U.S. - get your local forecast at https://t.co/VyWINDk3xP. Also, note that this foul weather could mean flight delays at Northeastern airports and general travel trouble on roads. Hello, winter. It's... nice to see you again.